For the implementation of ARD (Afforestation, Reforestation, Deforestation) activities in tropics, both biodiversity and local benefit should be seriously considered and incorporated. In REDD+ (Reducing Emission from Deforestation and Degradation), for example, these are included as two major issues of “safeguard” for its practice. Without consideration of these aspects, any kind of ARD would result in vain. This is very evident from the failed practice of revegetation trials in the post-logging degraded area or denudation for the land use changes. In such circumstances, no forest resources will be sustained for longer term. Nevertheless, these two issues are frequently observed as typical examples of “trade-off” relationship, such as intensive use of the forest resource or production-oriented resource management system, and they will possibly lead the deterioration of biodiversity. Therefore, for seeking the co-benefit between the biodiversity and local community (people), we have to study thoroughly the parameter influencing each of the issues. In other words, local governance including forest management regime, secure access to resources and land ownership are controlling parameters for optimizing the co-benefit of biodiversity and local people. 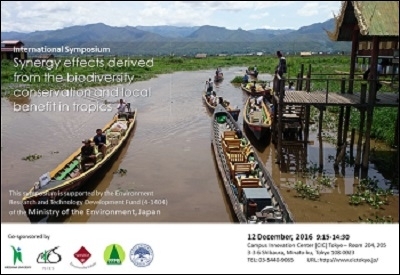 In this symposium, inviting experts on this field in Myanmar and Malaysia, we would like them to elaborate the topics related to these issues and discuss any possibility for developing the tools and schemes that maintain the co-benefit in tropics. □Tools and schemes for co-benefit & SATOYAMA initiatives, etc. Toshinori Okuda, Professor, Graduate School of Integrated Arts and Sciences, Hiroshima University.